Raw material feeding to high speed mixer can be manual through the fully open lid, or completely automatic through suitable inlets on the lid. Conical mixing bowl structure helps preventing an adhesion of raw material and providing a smoother flow of materials inside the bowl. Finished product is discharged by centrifulgal force through pneumatic discharge valve into product container or directly to fluid bed dryer bowl. Suitable for pharmaceuticals, foods, chemicals, cosmetics, electronics, ceramics, rubbers and plastic industries etc. raw material binder of mixing and granulating. Use different powder, by horizontal high speed get well mixed, and proper binder, through vessel side chopper cut to particles, and by discharge port to take out finished products, normally the dry powder mixing time is about 1~3 minutes, the wet grains making is about 3~5 minutes to be finished. Both main agitator and chopper motor can adjust with high speed and low speed. Optimal safety and integrity protective action device. Mixing and grains making timer automatic control, also check time lapsing. Operation switch independently, also show loading current. Mixing vessel and material discharge protection cover if no close, the m/c will not running, vice versa, this m/c will automatic stop if open it suddenly during operation. By through the compressed air of 2£gm absolute filter into special designed agitator and chopper shaft air seal to prevent powder into transmission shaft from contamination. 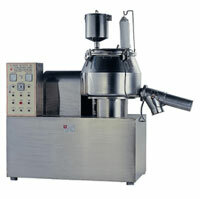 This machine designed to comply with cGMP requirements, safety structure, no contamination, easy to operature and clean, the body material made of AISI 316L stainless steel, general speaking, it consists of the mixing vessel, agitator blade, chopper blade, frame, motor transmission device, discharge port and control system, meantime the control box use the device of proof of water and dust. It designed of waterproof that can wash tank inside. With the cone shaped mixing cylindrical vessel that make peripheral powder and binder toward the center for better mixing effect. The upper cover with raw material inlet and dust collection filter bag, in order to keep the products from dust contamination. Adopt pneumatic system, and the cover with safe protection switch. Big volume type with the CIP cleaning device. Rapid operation so as to let finished product short discharge time. 123 Lunghsiao ST., Kueishan, Taoyuan City, Taiwan. No.2, Ln. 302, Xinshu Rd., Xinzhuang Dist., New Taipei City 242, Taiwan, R.O.C.